Forcey students and parents are welcome in the library! PreK-grade 5 classes have a designated time to visit the library weekly. 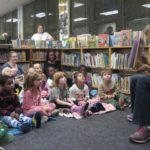 Students may listen to a story, browse for books, and learn how to use the library and its resources. 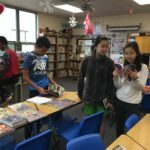 Middle school students may visit the library with a class or on their own. Parents may also get a library card and check out books! The library celebrates the rich cultural diversity of FCS students throughout the school year. 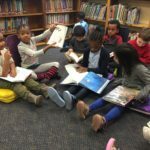 Parents are welcomed into the library to read to students during Hispanic Heritage month, Black History month, European Heritage month, and Asian Pacific American Heritage month. 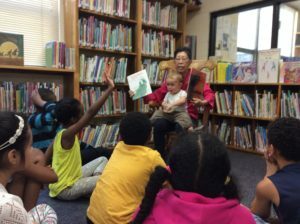 In May, the library was honored to have guest author, Al-Ling Louie, visit to read her first published book, Yeh-Shen: a Cinderella Story From China, and talk about her other books. 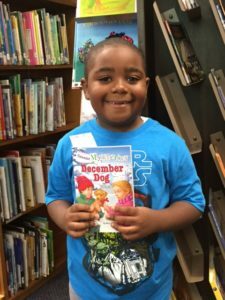 Fall is Book Fair Time! 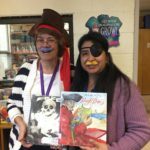 The book fair, held in late October, is the annual fundraiser for the library. There are books for sale for all ages, with 25% of the proceeds benefiting the library. This is a great time to shop for Christmas gifts. FCS students look forward to this sale all year! Children’s books are sold very inexpensively, with most selling for nickels, dimes and quarters. Students love to browse the June sale for summer reading and count their change for purchases. This sale depends on parent donations, so please bring your used children’s books to the school library, room 162, anytime. The library subscribes to databases to help students with homework and research assignments. The databases are available to students both at school and at home. Social Issues Resources Series. Login required. Access to this popular site is paid for by the Booster Club! Login required. For younger researchers. Login required. For log-in information, as well as any questions about using the databases or about the library, please contact Heidi Corcoran, Library Media Specialist.